"Did you know this theater is haunted?" is the first sentence spoken between characters in this movie. It comes roughly 45 minutes into the film. That's either boldness or craziness on the director's part. But the director here is Malaysian-born Ming-liang Tsai and in this case, boldness is appropriate. Goodbye, Dragon Inn stars Tsai regular Kang-sheng Lee as a smoking movie-goer in a theatre on the verge of its last show. 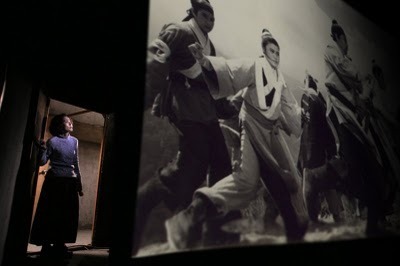 When a Japanese tourist (Kiyonobu Mitamura) takes shelter in the theatre to get out of the rain he encounters all sorts of quiet folks who busy themselves watching King Hu's 1967 martial art film "Dragon Inn"; most memorable of these is the disabled ticket taker women (Shiang-chyi Chen). This film is a warm and comedic homage to film-going of yesteryear and is full classic Tsaisms, including a fascination with water and immeasurably long shots where very little happens. While not as good as either The River or I Don't Want to Sleep Alone, the addition of real-life Chinese martial art movie heroes Tien Maio and Chun Shih as themselves was a brilliant move.